Hip No. 407, Sexyama, a gray or roan filly by Cairo Prince consigned by Halcyon Hammock Farm, Agent, breezed three eighths in :32 3/5 to post the fastest work at the distance at the second session of the Under Tack Show for the Ocala Breeders’ Sales Company’s 2018 June Sale of Two Year Olds in Training and Horses of Racing Age. She’s a half sister to stakes placed Cowboy Cool out of Academie D’Amour, by Royal Academy. As a testament to the OBS surface, the session concluded on a dry track despite an interruption by heavy afternoon showers. Two horses worked three eighths in :32 4/5. Hip No. 245, Astro Empire, a bay colt by Astrology consigned by Doble Jak LLC, is out of Sizzle Dress, by Henrythenavigator, a daughter of stakes placed Dressed to Kill. Hip No. 297, Vow Me Now, consigned by Halcyon Hammock Farm, Agent, is a bay colt by Broken Vow and a half brother to graded stakes placed stakes winning OBS graduate Get Jets out of Sunny, by Dixieland Band. Hip No. 402, a chestnut colt by Fed Biz consigned by Potrero Stables, Agent, turned in the sesssion’s fastest quarter, clocked in :20 3/5. He’s out of You Laughin, by Sharp Humor, a half sister to grade one winner Sweet Reason. There were six quarters in :20 4/5. Hip No. 235, consigned by Southern Chase Farm, Inc. (Greg & Karen Dodd), Agent, is a chestnut colt by New Year’s Day out of Sign Off, by Distorted Humor, a daughter of grade one stakes winner Imperial Gesture. Hip No. 247, a dark bay or brown colt by Flatter consigned by Wavertree Stables, Inc. (Ciaran Dunne), Agent, is a half brother to graded stakes placed stakes winner Skipalute out of Skipstone, by Montbrook. Hip No. 263, also consigned by Wavertree, is a chestnut filly by Street Boss out of Southern Swing, by Dixieland Band, and is a half sister to stakes winner Mr. Pee Vee. Hip No. 375, a gray or roan filly by Itsmyluckyday consigned by Envision Equine, Agent, is a half sister to graded stakes placed stakes winning OBS graduate Sweetontheladies out of stakes placed Whataclassybroad, by Yankee Gentleman. Wavertree also consigned Hip No. 426, a gray or roan filly by The Factor out of stakes winner America’s Friend, by Unusual Heat, a full sister to graded stakes placed stakes winner Bel Air Sizzle. Hip No. 446, Track Star, a dark bay or brown filly by J P’s Gusto consigned by Journeyman Bloodstock Services, Inc. (Brent & Crystal Fernung), Agent, is a half sister to stakes placed Joe Hollywood out of A True Star, by Yes It’s True. Hip No. 248, a dark bay or brown colt by Handsome Mike consigned by Blue River Bloodstock, Inc., Agent, is out of Slamming Well, by Grand Slam, a half sister to stakes winning OBS graduate Calico Bay. Hip No. 257, a bay colt by Shackleford consigned by Envision Equine, Agent, is a half brother to graded stakes placed Pedaltothemedal out of Something Brewing, by Meadowlake. Hip No. 267, consigned by Woodford Thoroughbreds, Agent, is a chestnut filly by Congrats out of Spinning Time, by Giant’s Causeway, a half sister to graded stakes placed stakes winning OBS graduate Boat Trip. Hip No. 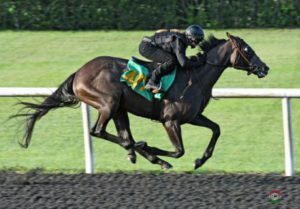 300, consigned by Ocala Stud, is a dark bay or brown colt by Adios Charlie out of Sweetly Valid, by Sweetsouthernsaint, a daughter of stakes winning OBS graduate Valid Forbes. Hip No. 323, a dark bay or brown colt by Shanghai Bobby consigned by Envision Equine, Agent, is out of There I Go, by Hennessy, a half sister to grade one stakes winner Karlovy Vary. Hip No. 325, consigned by Eddie Woods, Agent, is a bay colt by Into Mischief out of stakes winner Three Graces, by Doneraile Court, and is a half brother to graded stakes winner Euphrosyne. Hip No. 357, a gray or roan gelding by Overdriven also consigned Ocala Stud, is a half brother to stakes winning OBS graduate R Girls a Charmer out of Velvet Charm, by Montbrook. Hip No. 427, consigned by Eddie Woods, Agent, is a gray or roan filly by The Factor out of champion Amor de Palacio, by Cashel Castle. There were five quarters in :21 1/5. Hip No. 259, a bay colt by Warrior’s Reward consigned by Dark Star Thoroughbreds (Stori Atchison), Agent, is out of Sophie’s Destiny, by Two Punch, a half sister to stakes winner Grand Appointment. Hip No. 319, Terminallastchance, consigned by Julie Davies LLC, Agent, is a dark bay or brown colt by Smart Bid out of Terminals Lastbuck, by Stonesider, a half sister to stakes placed Frivolous Buck. Hip No. 392, consigned by Halcyon Hammock Farm, Agent, is a bay colt by Point of Entry out of Wishcraft, by Lion Heart, a half sister to grade one winner Dream of Summer, the dam of graded winners Creative Cause and Destin. Hip No. 401, a chestnut colt by Uncaptured consigned by Hawks Nest LLC, is out of Yes It’s Valid, by Yes It’s True, a daughter of stakes winning OBS graduate Valid Forbes. Hip No. 431, Tbtwelve, a chestnut colt by Trappe Shot consigned by Tom McCrocklin, Agent, is out of A. P. Indy Lover, by Pure Prize, from the family of champion Hansen. Two horses shared honors for the day’s fastest eighth, stopping the timer in 9 4/5. Hip No. 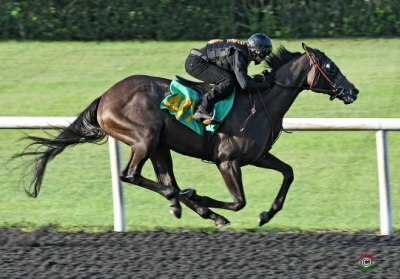 332, consigned by de Meric Sales, Agent, is a dark bay or brown colt by Dialed In out of Top Trick, by Hat Trick (JPN), a daughter of graded stakes winner Blushing Heiress. Hip No. 403, Getthe Muny Bernie, a chestnut colt by Munnings consigned by Randy Bradshaw, Agent, is a half brother to stakes winner Beyond the Reach out of Zadie Creek, by Repriced. There were eleven eighths in :10 flat. Hip No. 232, a bay colt by Orb consigned by Sequel Bloodstock, Agent, is a half brother to graded stakes winner Bourbon Courage out of Shine Forth, by Carson City. Hip No. 240, Periodical, a gray or roan filly by Data Link consigned by Niall Brennan Stables, Agent, is a half sister to graded stakes winner Onus out of Silviculture, by Forestry. Hip No. 242, a bay filly by Csaba consigned by Whitman Sales LLC, Agent, is out of Sister Gal, by Indy King, from the family of graded stakes placed OBS graduate Wedding Singer. Hip No. 293, a chestnut filly by Crown of Thorns consigned by J R Racing Stables, is out of Sugarlick, by Congrats, a half sister to graded stakes winner Trippi’s Storm. Hip No. 307, consigned by Top Line Sales LLC, Agent, is a bay colt by Union Rags out of Sweet Zapper, by Ghostzapper, a daughter of grade one stakes winner Sweet Symphony. Hip No. 317, consigned by de Meric Sales, Agent, is a bay filly by Shackleford out of Tenacious Tripp, by Trippi, a half sister to stakes winning OBS graduate Dynhocracy. Hip No. 320, a bay colt by Run Away and Hide consigned by Stephens Thoroughbreds LLC, Agent, is out of Texit, by Tapit, a half sister to graded stakes placed My Corinthian. Hip No. 344, consigned by Marcial Galan, is a gray or roan filly by Can the Man out of stakes placed Tutu, by Corwyn Bay (IRE), and a half sister to stakes placed Avenue Sister. Hip No. 366, Mercusio, a dark bay or brown colt by Elusive Quality also consigned by Marcial Galan, Agent, is out of Vita Vittoria, by Medaglia d’Oro, a half sister to stakes winner Saturday’s Child. Hip No. 411, Random Number, a bay colt by Uncle Mo consigned by de Meric Sales, Agent, is a half brother to graded stakes placed Honor the Fleet out of stakes winner Afleet Lass, by Northern Afleet. Hip No. 450, consigned by Pick View LLC, is a bay colt by Northern Afleet out of Autumn Memories, and is a half brother to stakes placed Edgy Memorie. The Under Tack Show continues Saturday, June 9th at 7:30 a.m. Hip No’s 451 – 675 scheduled to breeze. The June Sale is scheduled for Wednesday, June 13th through Friday, June 15th with each session beginning at 10:00 a.m. Hip No’s 1-300 go on the block Wednesday, Hip No’s 301- 600 will be offered Thursday and Hip No’s. 601-936 will sell on Friday.